Several energy stocks are seeing a boost from higher oil prices, while others are headed the other way as bankruptcies hit the sector hard. Oil prices are up, but two well-known producers are bankrupt in a mixed-news day in the oil industry. 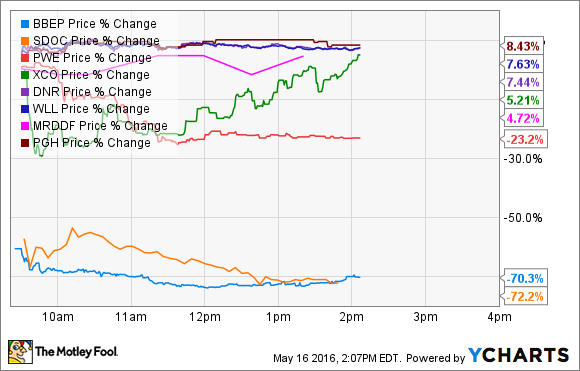 Today (May 16, 2016) is a mixed bag for oil stocks, especially independent producers. To start, the market news is generally positive, at least for the going interests with strong enough balance sheets to ride out the ongoing downturn. Both Brent and West Texas Intermediate crude oil prices are up more than 2% today, with WTI trading above $47.50, and Brent approaching $49.00 per barrel. But at the same time, two well-known oil producers that have been on the cusp of financial viability finally filed for bankruptcy earlier today, while another struggling producer released earnings that failed to meet expectations. The biggest news is that both Breitburn Energy Partners LP (NASDAQOTH:BBEPQ) and SandRidge Energy (NYSEMKT: SDOC) filed for Chapter 11 bankruptcy protection today. SandRidge's filing was essentially a pre-negotiated one, which essentially awards control of the company to creditors in exchange for $3.7 billion in debt. And while this prepackaged deal all but assures the company's future under different ownership, and will wipe out common shareholder equity in the company, it still must be approved by a bankruptcy court. Breitburn Energy's bankruptcy, however, isn't likely to go as smoothly. The company has reached preliminary agreements with some of its debt holders and creditors, but it's filing is far from "prepackaged," as the oil producer continues to negotiate with other senior debt holders over the particulars. However, it should be clear that, just as with Breitburn and other recent bankruptcy filers, common shareholders will almost certainly be left with no equity in the company when it reemerges from bankruptcy. Also today, Penn West Petroleum Ltd (USA) (NYSE:PWE) released first-quarter financial results, and it wasn't pretty -- and I'm not even talking about the actual results of its operations. The big, scary part of Penn West's filing was that the company is getting close to pushing the limits of a number of debt covenants that would put it in default on at least a portion of its $1.8 billion in total debt. The company's senior debt to EBITDA ratio was 4.4, which was still below the 5-to-1 ratio in the covenant, but continually low oil prices put the company in a position where it could be in trouble as soon as the end of the current quarter. How big of a concern is this? Pretty big, considering the company said, "Our ability to continue as a going concern depends on the ability to enter into amending agreements with our lenders," in a release. EXCO Resources Inc (NYSE:XCO) shares also fell sharply earlier in trading, though its stock has since recovered. On Friday, EXCO announced that it had formed a "special committee" to "explore strategic alternatives" for the company. This is the same refrain that the market heard from many of the recent bankruptcy filers in the months before those companies ended up seeking court protection, so it doesn't bode well for EXCO's prospects. At the end of last quarter, EXCO reported $1.4 billion in long-term debt, and less than $50 million in cash. And while its stock has rebounded after falling sharply in early trading today, shares are down 60% since the announcement on May 13. Denbury Resources (NYSE:DNR) announced it was swapping $135.3 million in senior debt for $83.8 million in new secured senior debt and 3.8 million shares of common stock. While the dilution isn't great for existing investors, the market is happy with the move, which reduces the company's total debt slightly, while not impacting its liquidity at all. Why would debt-holders agree to this move? In short, the new debt they received in the deal puts them "closer to the front of the line" in terms of the company's obligations to its debt holders. The common shares are nice icing if the company survives the downturn, but the real reason this happened was that these debt holders are better-positioned to get paid if things go from bad to worse for Denbury. There's also some merger news happening today, as Range Resources Corp. (NYSE:RRC) and Memorial Resource Development Corp (NASDAQ:MRD) announced they will merge. In short, Range will acquire Memorial in an all-stock transaction that values Memorial at $4.4 billion, including $1.1 billion in net debt that Range will assume as part of the acquisition. Shares of Memorial are up 7% on the news, while Range Resources stock is trading down more than 9%. The net effect of the new shares, which will be issued to Memorial Resource shareholders, will result in Range investors holding 69% of the merged company, with Memorial investors holding the 31% balance. Whiting Petroleum Corp (NYSE:WLL) and PenGrowth Energy Corp (USA) (NYSE:PGH) shares are up 7% and 13%, respectively, today, though on no material news other than higher oil prices. The reality for both companies, frankly, is similar to many of their independent oil producer peers: High debt and low oil prices have them in an unenviable position. PenGrowth Energy reported $1.3 billion in long-term debt last quarter, while Whiting had over $5 billion, and both companies saw their cash from operations fall around 40% over the past year, as oil and natural gas prices have come down sharply. Even after the recent recovery from decade-plus lows in February, many oil producers are still realizing prices that fail to cover their total expenses, particularly when heavy debt balances are figured in. It's a sad day for shareholders of Breitburn and SandRidge Energy. While both company's stocks will continue to trade while bankruptcy proceedings and reorganization play out, shareholders need to understand that they are last in line now. In other words, every lender, vendor, or other creditor will get a piece of the company's assets or an equity holding in the company when bankruptcy is complete, before common shareholders. In other words, it's probably best to sell your shares soon and reclaim whatever pennies are left of your investing dollars before the shares are eventually de-listed, and you're left with absolutely nothing. As to the rest of these independent producers, there remains a lot of risk. Oil prices have rebounded nicely over the past few months, but part of the more recent move up is related to production declines in Africa and Canada that are unlikely to be long term, while global demand growth remains very low. To put it bluntly, oil prices aren't guaranteed to keep going up, and they could actually decline again in the near term. Furthermore, the bloodletting has started, but it's likely far from over. Oil prices are still relatively low for many debt-laden producers, and barring a strong recovery in the next couple of quarters, there will be more producers coming up short on their debt covenants. Bottom line: If you choose to invest in any independent oil or gas producers, make sure you understand their debt picture, or you may end up taking on more risk than you realize.